x ray High Voltage Cable is an important part of X-ray machine. X-ray machine is generally composed of X-ray tube, high voltage generator, control equipment, cooler, mechanical equipment and x ray High Voltage Cable. The x ray High Voltage Cable connects the high voltage generator with the x ray tube in different types of X-ray machines.The function is to send the high pressure output from the high pressure generator to the two poles of the x ray tube, and the heating voltage of the filament to the tube. To maintain the normal operation of the X-ray machine. 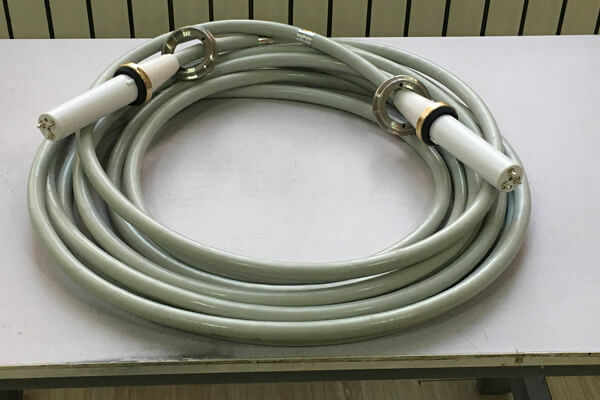 Secondly, the use of x ray High Voltage Cable should be careful to prevent excessive bending of x ray High Voltage Cable. Furthermore, the bending radius should not be less than 5-8 times of cable diameter to avoid cracks and reduce the insulation strength. In addition, at ordinary times also should keep the cable dry clean, avoid oil, moisture and harmful gas erosion, lest rubber ageing. The Newheek x ray High Voltage Cable is divided into several types, including 75KV and 90KV. The length can be customized according to the customer’s needs. Newheek x ray High Voltage Cable can meet your different purchasing needs. What is the role of Medical x ray high voltage cable? Are our high voltage cable connectors suitable for you?